We all have extremely busy lives and often this means that some of the hobbies we enjoy doing in our free time fall to the waysides. If you are someone who loves to dance and who has been attending dance classes at the Modern Ballroom Dance Studio, it likely that you have missed a social dance class from time to time. While we understand that this certainly happens, we also know that one missed class can lead to two and then all of a sudden it has been three months since you have shown up at the studio. 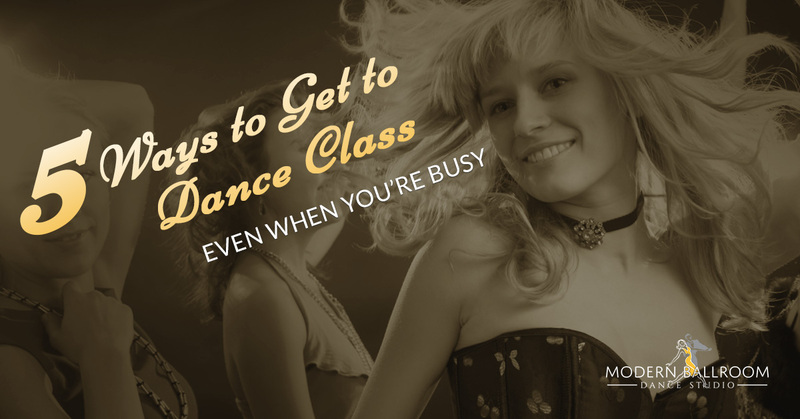 Keeping this in mind, we thought we could give you some helpful tips as to how you can make it to your dance class even when you are super busy. Trust us, you will be happy you did. Momentum is one heck of a motivator for people who have a lot to accomplish in the day. While you might be tempted to go home after a long day of working and running errands, you may be able to fit even more into your day than you were aware of. When you have been going, going, going, don’t take your eagerness to lay on your couch as a sign that you aren’t able to do more with your night. Show up to the studio, start to dance, and see how long it takes you to remember that you were tired when you first arrived. We bet it won’t take very long at all. You have likely been told before that writing things down is a very effective way for you to remember obligations or appointments you have. However, what you may not know is that writing down your goals can actually cause a chemical reaction to occur in your brain that can help you to start paving a road to both action and success. If your goal is to attend one dance class per week or to stretch each day in preparation for your classes, write it down and watch it become a reality. Sometimes we simply put far too much on our plate, leaving us beyond thinly spread and unable to do everything we originally said we could. It is important that you know how to set boundaries so that you can provide yourself with the things that you need to be happy and healthy. Plain and simple, you cannot take care of the needs of others unless you are first taking care of your own needs. When it comes to being someone who enjoys social dancing, it is important that you remember that you are not required to invest in expensive clothing or shoes in order to be part of our studio community. If you love to dance, that is enough as far as we are concerned. Don’t worry about feeling as though you don’t fit in. At the Modern Ballroom Dance Studio, we are one big dancing family. Dance is a rare form of art that allows you to use all of your senses at once. It is also something that brings joy and lightness to people’s lives when they enjoy it. If you are someone who finds bliss in dance, be sure to do it as often as you possibly can. After all, you only live once, you might as well make that life as beautiful as possible. If you are someone who is interested in learning more about social dance classes and you are ready to make dance a part of your daily life, call the Modern Ballroom Dance Studio today! We look forward to seeing you in one of our upcoming dance classes in Woodbridge.